Potassium Rich Foods You Must Include Your Regular Diet! In the recent times, potassium is the most talked about mineral that is essential to the proper functioning of the body. Are you wondering what is the big deal about high-potassium foods? The answer to this question is that potassium rich foods are an essential part of everyone’s diet. Potassium is predominantly an important mineral that is important for various cell functions and proper development of the body. It is present in the body fluids and cells as ions and chloride. The total potassium content in the body makes up to 98% and is completely found intracellular. Potassium is an essential mineral required to maintain electrolyte and fluid balance in the body. 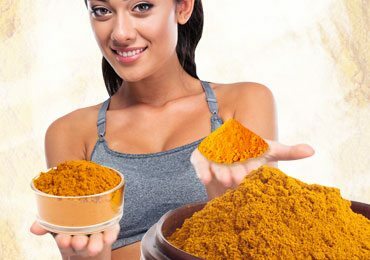 It is one of the vital minerals that plays an important role in Neuro-muscular, renal and cardiac functions. 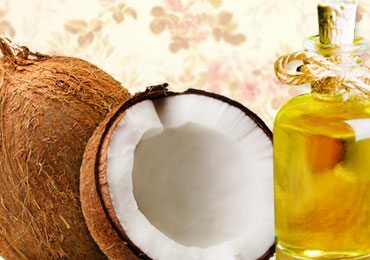 It is predominantly intracellular and can also be obtained through various food sources of potassium in the diet. Our body functions appropriately and depends on the optimum levels of potassium outside and inside of the cells. Building proteins and muscle mass. Maintaining bone mass and density. Activation and function of certain enzymes. Maintaining acid-base and osmotic balance within the cells. Regulating neuro-muscular signals from the brain to involuntary and voluntary muscles. Regulates the electric rhythm of the heart. Transfer of nutrients through cell membranes. Who is at Risk To Develop Potassium Deficiency? What are the foods high in potassium? 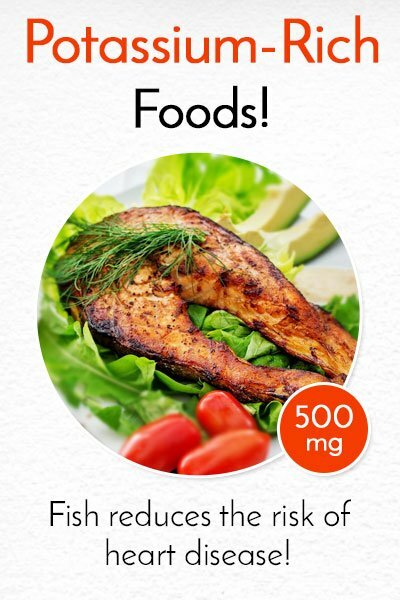 There are a lot of potassium sources to choose from to meet the recommended daily requirement. 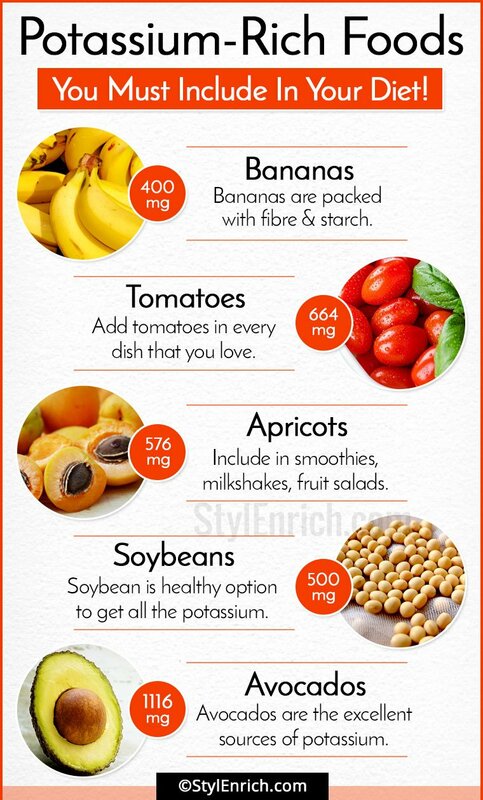 The following list includes some of the best potassium rich foods to include in your daily diet. This may come as a surprise to you, but sweet potatoes are indeed rich in potassium. 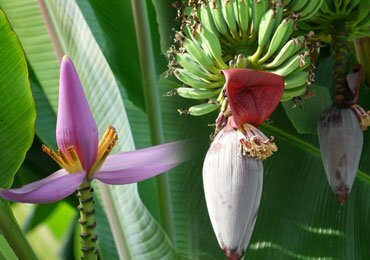 They are considered one of the best sources of potassium. 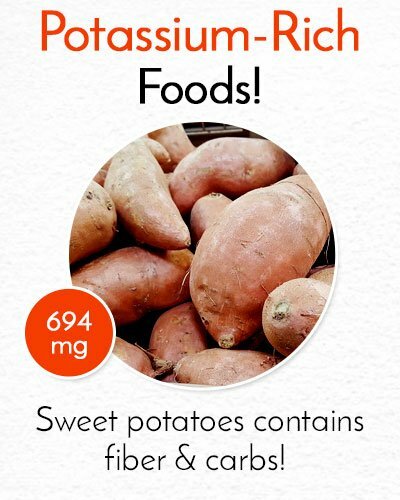 1 sweet potato contains about 694mg of potassium, 131 calories, and loads of fiber, carbs and beta-carotene. Whether boiled, mashed, grilled or baked, sweet potatoes can be consumed in any form and are one of the delicious yet healthy foods you can eat. Tomatoes are considered to be among the best high potassium foods to be included in your diet. 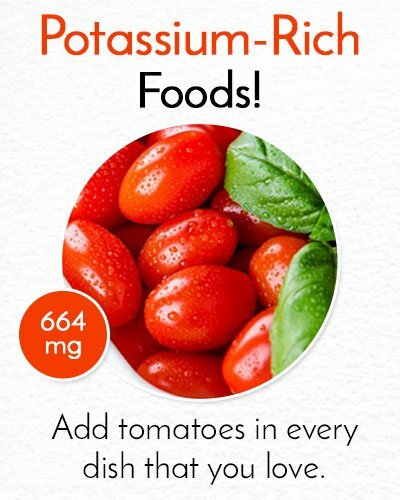 One cup of tomato paste contains 664mg of potassium, while half cup contains 549mg. So if you want to get enough potassium in your diet, then make sure you add tomatoes in every dish that you love. If you have the habits of throwing away the green leaves of the beet, then think twice. Those bitter green leaves when cooked contain a high content of 644mg of potassium per cup. They are also rich in anti-oxidants and folate. Beans are considered to top the list of high potassium foods. About half a cup of cooked beans contain 600mg. 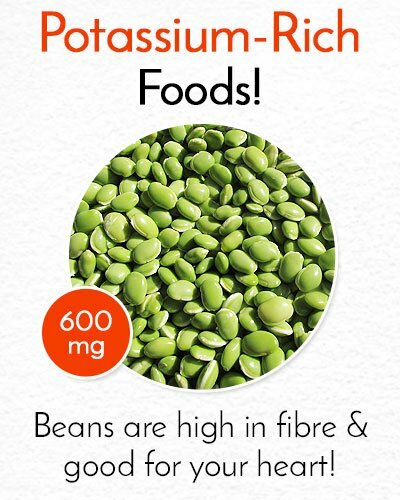 Beans are also high in fibre and good for your heart. Hence, it is a smart to include beans as a big part of diet. Did you know that your delicious and all favourite yogurt is an ideal source of potassium too? 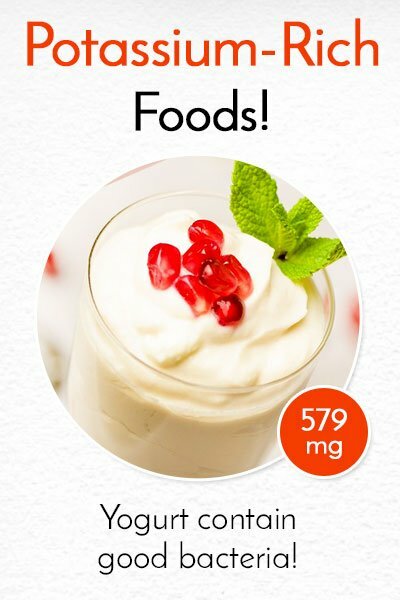 1 cup of plain non-fat yogurt contains about 579mg of potassium. Some of the delicious ways to include yogurt in your diet is swapping it by whipped cream, instead of mayo instead of sandwiches and mixing it with cereal along with breakfast. Yogurt also contain good bacteria and probiotics that keeps the gut healthy and aid digestion. Clams is the rarest food option one can think of. 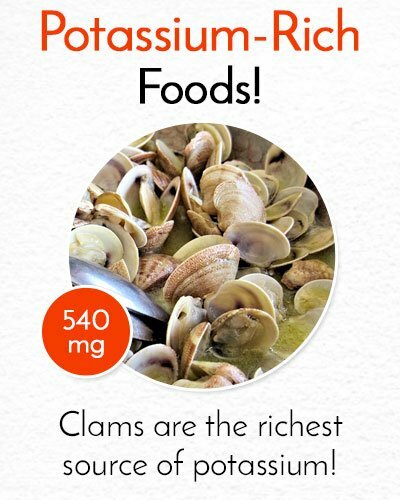 But surprisingly, Clams are the richest source of potassium. 5 Ounces of fresh or canned clams contain about 540mg of Potassium and a high content of Vitamin B12. Tossing them into your favourite pasta makes them more delicious to eat. Prunes are among the healthiest foods high in potassium. 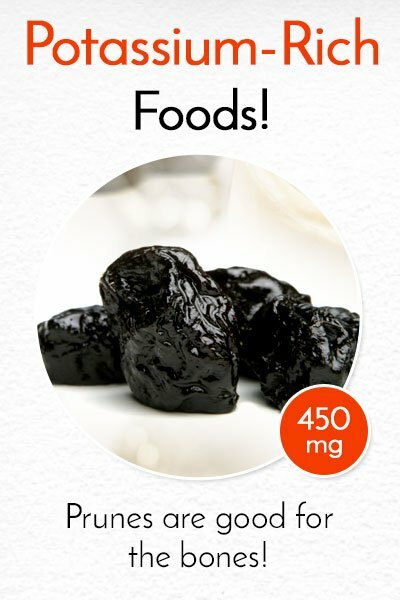 1 cup of stewed or cooked prunes have close to 450mg of potassium. Prunes are also known to be good for the bones. Women and men who consumed prunes regularly showed higher bone density than those who did not. 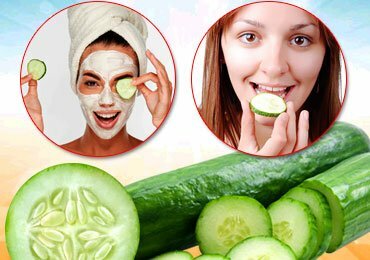 These wonder vegetables are not just good for your eyes, but are the richest source of potassium too. 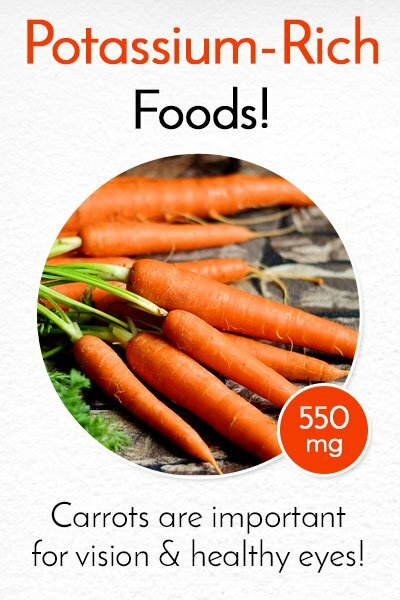 ¾ cup of chopped carrots or grated juice contain about 550mg of potassium. Carrots are also rich in Vitamin A and beta-carotene that plays an important role in vision and healthy eyes. If you are looking for a healthy alternative to sugar or honey, then molasses will come to your rescue. 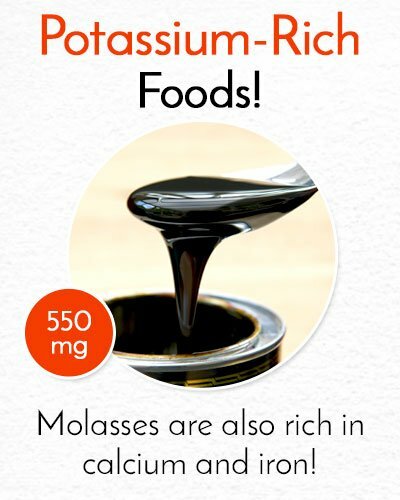 1 tablespoon of molasses has a high content of 500mg of potassium. Just 1 tablespoon will meet your daily requirements of potassium. Molasses are also rich in calcium and iron. Fishes are known to be the foods high in potassium. Fishes like tuna are known to contain nearly 500mg of potassium. There are several other reasons other than potassium to include fish into your diet. Eating fish regularly can reduce the risk of heart diseases and can increase your life span. Fish are rich in healthy fats that are good for your body. Soybeans are rich in protein and reduce inflammation in the body. Additionally they are great sources of potassium. 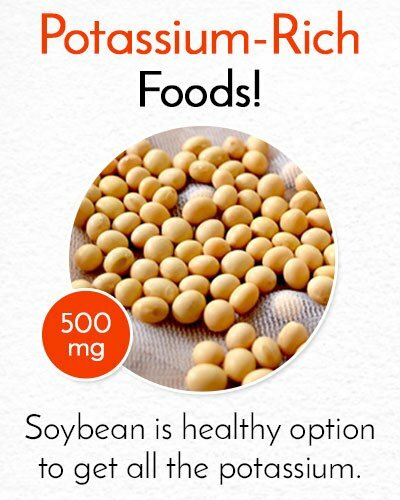 Half a cup of cooked soybeans contain about 500mg of potassium. For people on a vegetarian diet, soybeans is the healthy option to get all the required potassium into the diet. Squash is one of the best high potassium foods that have very less calories and also contain high quantities of Vitamin A and fiber. 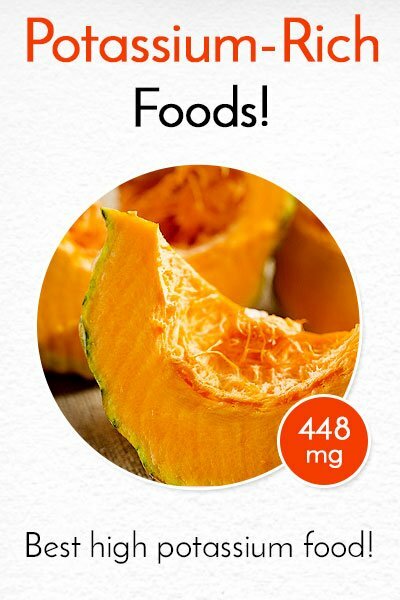 About half a cup of squash nearly contains 448mg of potassium. All of us know that there is high potassium in Banana. But do we know how much? And do we really incorporate bananas into our daily diet. 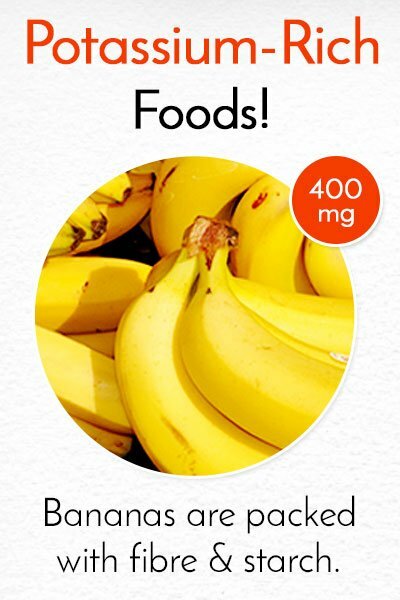 One medium sized banana contains about 400mg of this healthy mineral. Bananas are packed with fibre and starch and is an ultimate solution to your hunger pangs. Bananas are healthy carbs that also helps boost metabolism. The only thought that comes about milk, is that it is a rich source of calcium. Did you know that milk has a high content of potassium too? 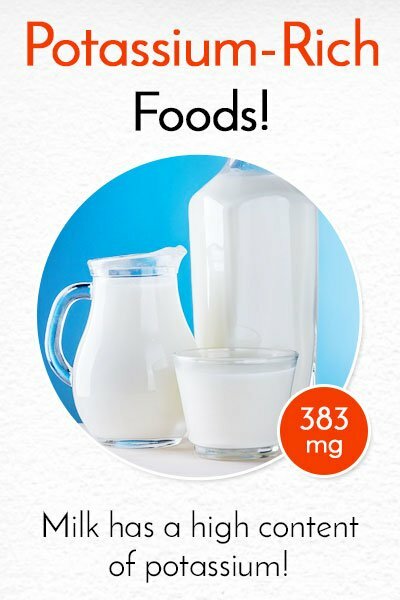 One full glass of milk contains about 383mg of potassium. Add this high-potassium fluid to smoothies and healthy milkshakes to sneak potassium into your diet. 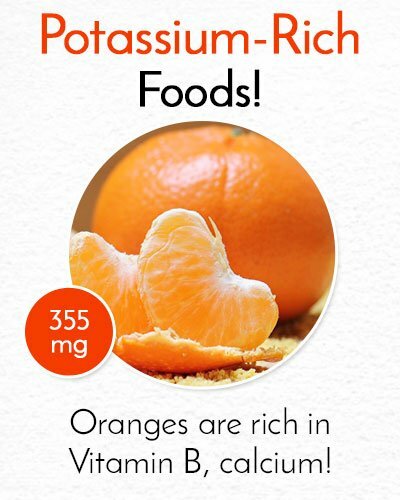 One of the healthy potassium rich additions to your diet is oranges. 1 cup of orange juice contains about 355mg of potassium. Oranges are also rich in Vitamin B, Folate and calcium. Mushrooms are not just low in calories but also rich sources of potassium. 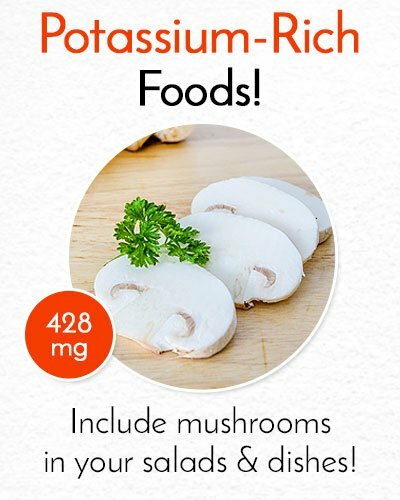 1 cup of sliced and cooked mushrooms contain about 428mg of potassium. You can include mushrooms in your salads, dishes and soups. Apricot are wonder fruits and considered the best high potassium foods that you can eat. 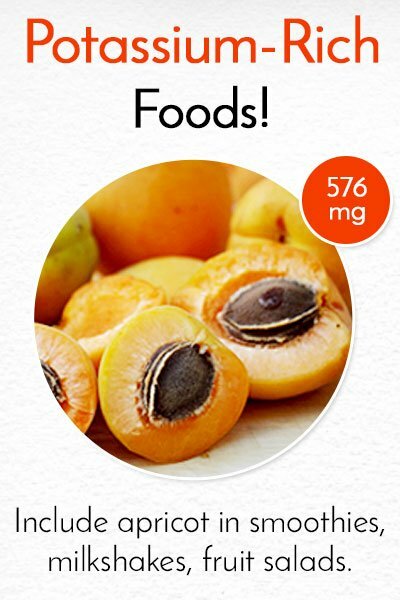 Half a cup of dried apricots contain about 576mg of Potassium. Dried apricots can be included in smoothies, milkshakes, fruit salads, cereals, or eaten plain as a whole. Did you know that this simple vegetable can be rich in potassium? 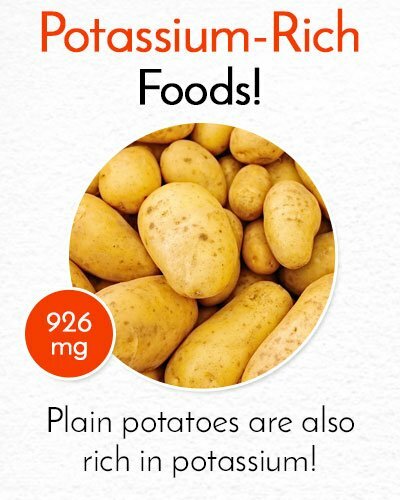 Apart from sweet potatoes, plain potatoes are also rich in potassium. About 200gm of baked potatoes contain 926mg of potassium. 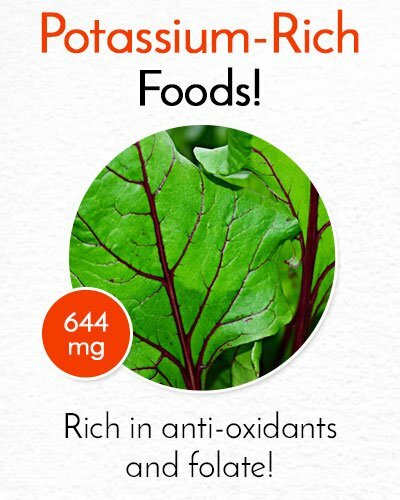 Dark leafy vegetables like spinach are one of best foods high in potassium. 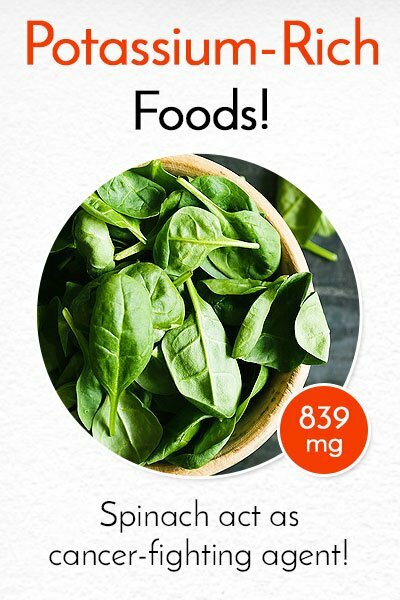 Spinach contains a whooping high concentration of 839mg per one cup of cooked spinach leaves. Spinach also contains chloroplast glycoglycerolipids that act as cancer-fighting agents. 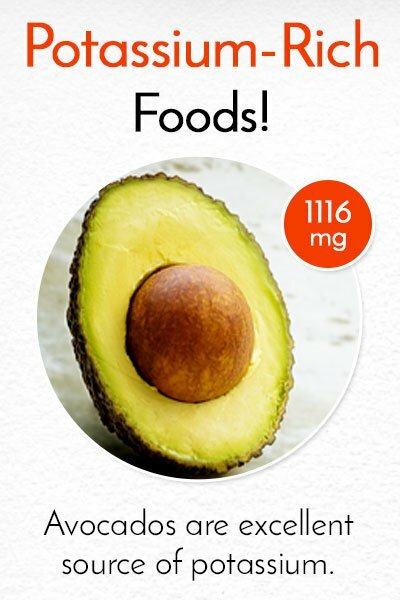 Avocados are the excellent sources of potassium that contains about 1116mg per cup of dried avocados. A high sodium diet is the main contributing factor for high blood pressure. 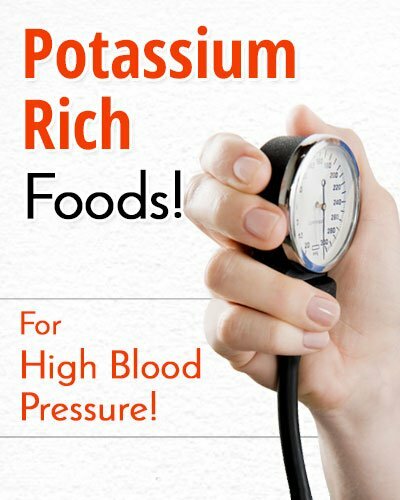 A diet rich in potassium counteracts the effects of sodium in the body. A diet rich in vegetables, fruits, fish, poultry, eggs, milk, beans, lentils and nuts is known to reduce systolic and diastolic pressure. During pregnancy, you not only require extra energy but also minerals including potassium. As your blood volume increases during pregnancy, you will also require more electrolytes to maintain the right balance. 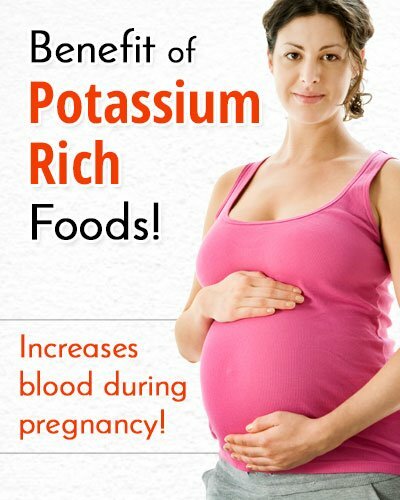 Pregnant women are recommended to around 4700mg potassium per day. 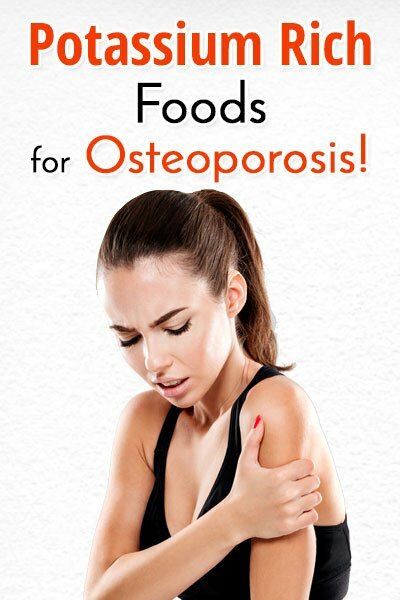 Bone mineral density is directly associated with potassium levels in the body. Potassium helps buffer acid balance in the body as they contain bicarbonate ions. 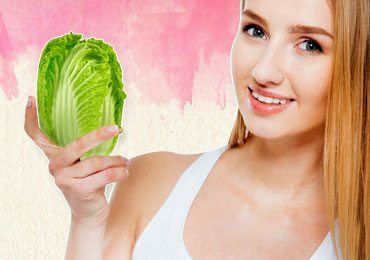 If there is deficiency of bicarbonate ions, the body will utilize minerals from bone to neutralize the acids consumed in the diet. This, in turn, leads to osteoporosis. Potassium also helps preserve calcium and other important minerals present in the bones. If you have diabetes, make sure you consult your doctor before consuming a potassium rich diet. 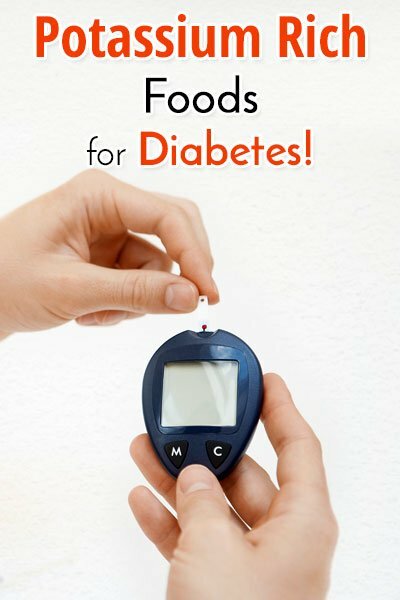 Diabetics ketoacidosis is a condition that occurs when the body produces high level of ketones. This happens when the body is unable to synthesize insulin. The fluids and insulin used to treat this condition makes the potassium levels to drop significantly. This is the main reason to consume potassium rich foods. Abnormally high calcium content in the urine causes kidney stones. Increasing potassium intake by consuming fruits and vegetable rich in potassium decreases calcium concentration in urine. 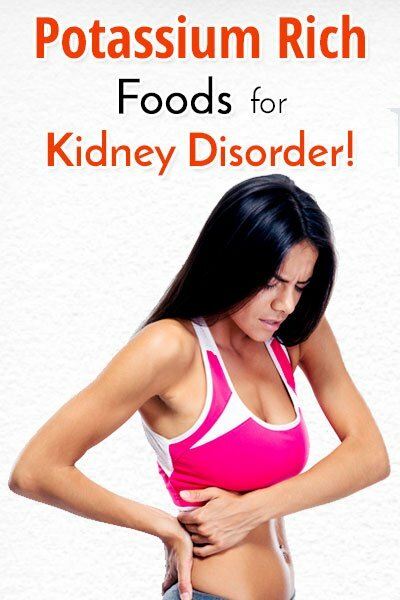 However, if you have other kidney disorders, consult your doctor first before taking a potassium rich diet. Potassium is a stable mineral that can be stored. You do not need any special requisites to store potassium rich foods. However, during cooking there can be some loss in potassium content. 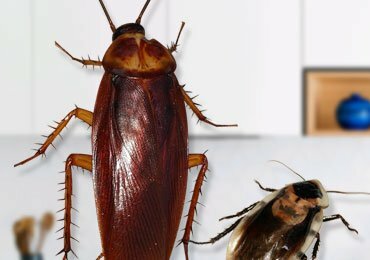 This can be prevented by minimizing the duration of contact of the food with cooking water. Some processed food contain fortified potassium to maintain potassium balance in the foods. Some of these potassium added components acts as preservatives, mold inhibitors, flavour modifier, stabilizer, salt-replacer and de-acidifier. The best way to retain potassium content in the food is to pay close attention to your methodology of cooking so as to ensure appropriate content of potassium in your food. 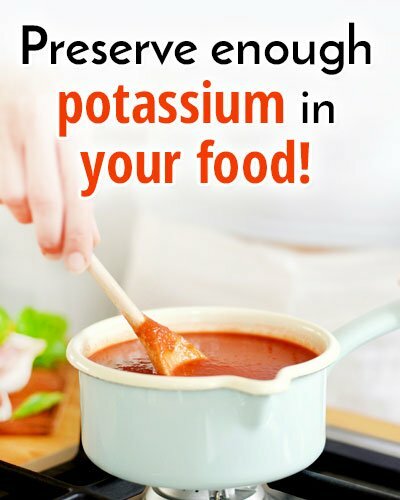 If you cook carefully, you can preserve enough potassium in your food to meet the daily requirement. Hyperkalemia: It is a condition caused due to excess intake of potassium. This leads to the breakdown of red blood cells causing injury to muscle tissues. Hypokalemia: It is a condition caused due insufficient potassium. This leads to mild tingling sensation in the legs, nausea, bloating, constipation, and abdominal cramping. If you consume potassium supplements, it is advisable to consult a doctor before taking them. Potassium is an essential mineral in the body and its adequate amounts must be maintained by the body. If you do not get enough potassium, you will have potassium deficiency and if you have excess potassium, other consequences will occur. It is important to maintain the right balance of potassium in the body. Consume these potassium rich foods in your regular diet and stay away from various health disorders. 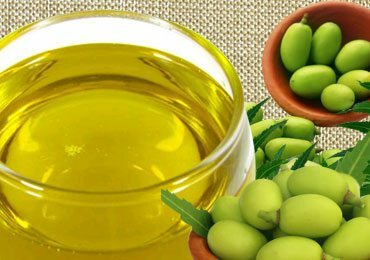 Neem Oil Uses And Its Amazing Benefits That You Never Heard Before!